Can you please tell us about your linguistic background? I grew up bilingual (English and Spanish), and spent the bulk of my childhood living in Latin America (Panama for 3 years, Bolivia for 4) and the Middle East (Turkey for 2 years, Bahrain for 3). I was always interested in language and different ways of speaking (and writing). My parents and their respective families spoke different varieties of Bolivian Spanish (generally ‘bajeño’ and ‘alteño’, as I later figured out), and I learned to speak Turkish so that I could play with other kids in my Istanbul neighborhood. Those were really formative experiences. But of course I knew absolutely nothing about linguistics until much later. After being admitted to UC Santa Cruz but before I’d chosen a major, my high school English teacher volunteered to help me plan my first quarter of study. The night before that meeting I started thumbing through the catalog, in alphabetical order. The first program of study to catch my eye was Applied Linguistics, which listed Phonetics as one of its first requirements, offered in the Fall. When I told my English teacher about it, he said, “Phonetics? That’s so dry!” To this day I can recall the look on his face (lowered brow, crinkled nose), the way he drew out the word dry with an extreme rising-and-falling intonation, and the way he pronounced the dr cluster in a way that sounded more to me like dv. (He was an Irish Catholic from New York.) Though I didn’t process it all this way at the time, Phonetics was clearly made for me. I was especially fortunate that the Phonetics instructor was Bill Shipley. As I wrote in his obituary several years ago, “I was sold on the whole of academia right then and there: I wanted to teach and impart knowledge like Bill did, I wanted to advise students like Bill did, and I wanted to care about what I do like Bill did. Later, when reading and appreciating his research, I wanted to do that like Bill did, too.” Whether or not I’ve succeeded, that’s been my guide ever since. The 1991 Linguistic Institute held at UC Santa Cruz was another pivotal moment. In the year leading up to that summer I was looking for work around campus, having gotten sick of working at the cafeteria and bored of working in a computer lab. I was hired as a general assistant in the Syntax (now Linguistics) Research Center, mostly helping to prepare for the Institute and eventually in the main Institute office itself. I had so much fun and learned so much during that time that I decided to throw myself fully into linguistics, and I haven’t looked back. The undergraduate linguistics program at UC Santa Cruz was generally just the best place to be at that time. I went straight from there to the then newly-founded graduate program at Rutgers, which was also just an amazing overall experience for me. My luck continued when I landed the job I now have at UC San Diego, where I’ve been since 2000. When did you first join the LSA? It must have been when I went to my first LSA Annual Meeting, held in Los Angeles while I was an undergrad at UC Santa Cruz. I drove there in my dad’s car with a grad student. That was fun. Can you tell us about the course you are teaching at the Institute? I’m co-teaching Computational Morphophonology with Colin Wilson. Our goal is to develop an approach to morphophonology (= the phonological expression of morphology) in which theory and computation are tightly integrated and mutually informing. 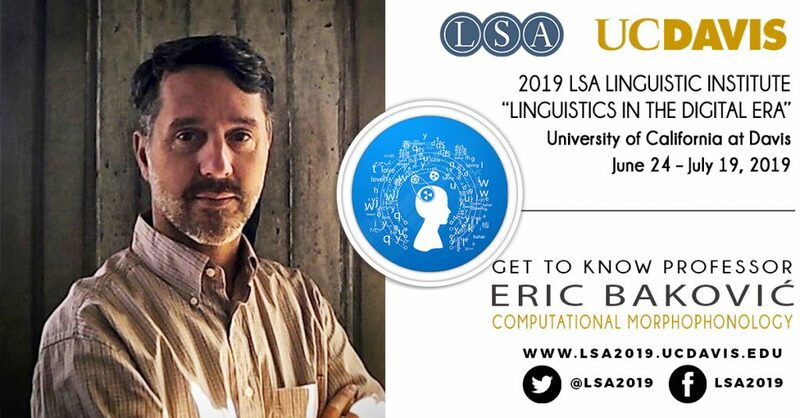 The course will be organized around several challenging areas of morphophonology, some of which have been addressed by computational models and some which require novel approaches. Students in the course will read linguistic and computational papers related to these areas, closely study a particular case of morphophonology from the literature or their own research, and complete a project that evaluates an existing model or develops a novel one for their case study. My research since the mid-2000s has been focused on the formal ways in which rules (in rule-based derivational frameworks) and constraints (in constraint-based non-derivational frameworks) can interact with each other, and the kinds of generalizations that can and cannot be captured by those different forms of interaction. At the 2015 Institute at the University of Chicago, I had a lot of productive conversations with Lev Blumenfeld, Jeffrey Heinz, Jason Riggle, Paul Smolensky, and Matt Goldrick that led me to the conclusion that what I’ve essentially been doing all this time is computational phonology. Those conversations led directly to rewarding research collaborations with Blumenfeld and Goldrick, and indirectly to a very satisfying collaboration with several students (Anna Mai, Adam McCollum, and Eric Meinhardt), now developing into a broader collaboration with other faculty at UC San Diego (Leon Bergen in Linguistics and Nadia Polikarpova in Computer Science and Engineering). What is your favorite hobby or pastime? I play drums, but not as often as I’d like. Sometimes I play drums with linguists, and I almost always get a chance to play at the Institute, so maybe I’ll get lucky again this time. In a parallel universe in which you are not an academic/linguist, what would you be? Thinking wishfully, a drummer in a working (rock) band. Realistically, though: probably an analyst of some boring sort or other. What are you most looking forward to about Davis? This will be my fifth Institute (the previous four being 1991 at Santa Cruz, 1993 at Ohio State, 1997 at Cornell, 2015 at Chicago), and my second teaching a course. Every experience I’ve had at an Institute has been both insanely productive and absolutely exhilarating, and I’m anticipating no different at Davis. I’ve only been to the UC Davis campus once, and only briefly, but I think it’s beautiful and I’m looking forward to biking around it. Plus, I’m originally from Northern California, so it’ll be good to be (relatively close to) home. Ice cream or Cake? Cats or Dogs? Quarter system or Semester system? Ice cream, dogs, and the semester system. But, since I’ve had to settle for the quarter system, I guess I’ll also have to settle for cats and cake. Not too bad, in the grand scheme of things. What advice would you give to graduate students interested in pursuing a career in linguistics? I know that what I’m supposed to say here is that academic job opportunities are tight, that grad students (both current and aspiring) should be realistic about this, and that they should acquire and develop the kinds of quantitative and technical skills and knowledge that will serve them well both on the academic job market and in industry. I do think that, but I have two caveats. First, I also think that students should do whatever keeps them interested and engaged, and not force themselves to do things that don’t keep them interested and engaged. If you’re not interested and engaged in the aforementioned quantitative and technical skills and knowledge, then you probably won’t acquire or develop them in ways that will distinguish you on the job market anyway. Second, I also think that linguistics is a small enough field that unidirectional shifts in the development of particular skills and knowledge can mean that too few of our best students will choose to develop other important skills and knowledge. I think our field saw that with fieldwork and language description half a century ago — though fortunately these have seen a resurgence more recently — and I believe we’re starting to see it with purely theoretical work now. I believe that the more diversity there is in our field in terms of different approaches and outlooks, the more we learn about language (in all of its relevant senses).